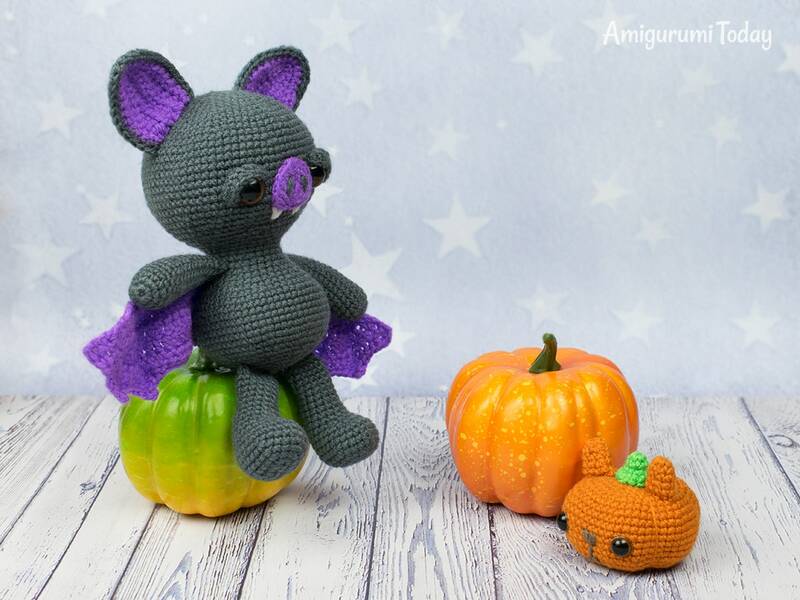 Place this spooky amigurumi bat on your shelve or windowsill for cozy, family-friendly Halloween decoration this fall! 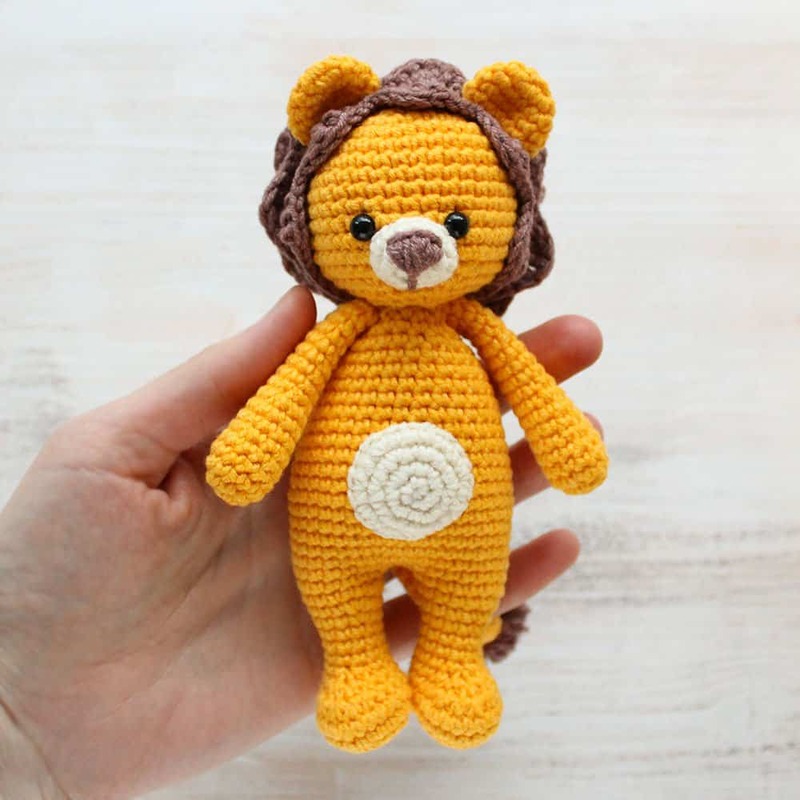 It is cute, cuddly – and only a little menacing! It’s sure to be a hit with kids and adults. 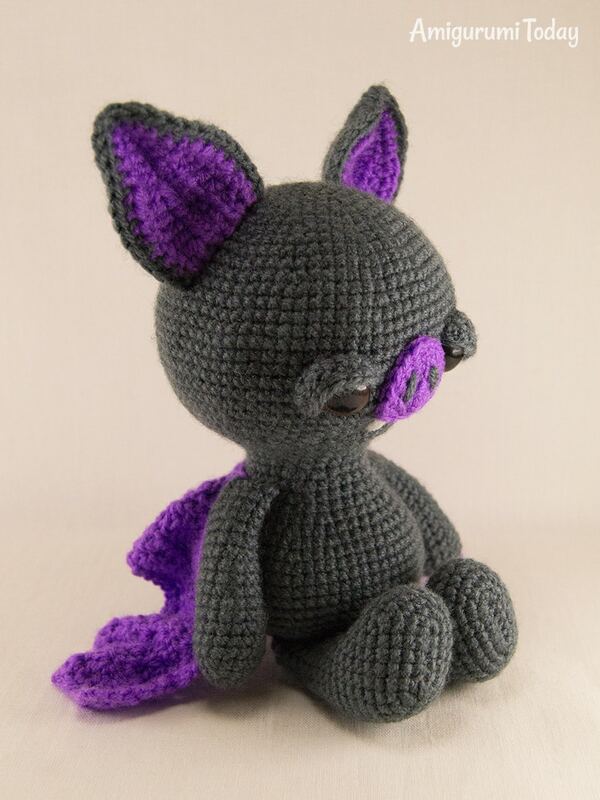 This amigurumi bat is about 21 cm (8.3″) tall with ears. 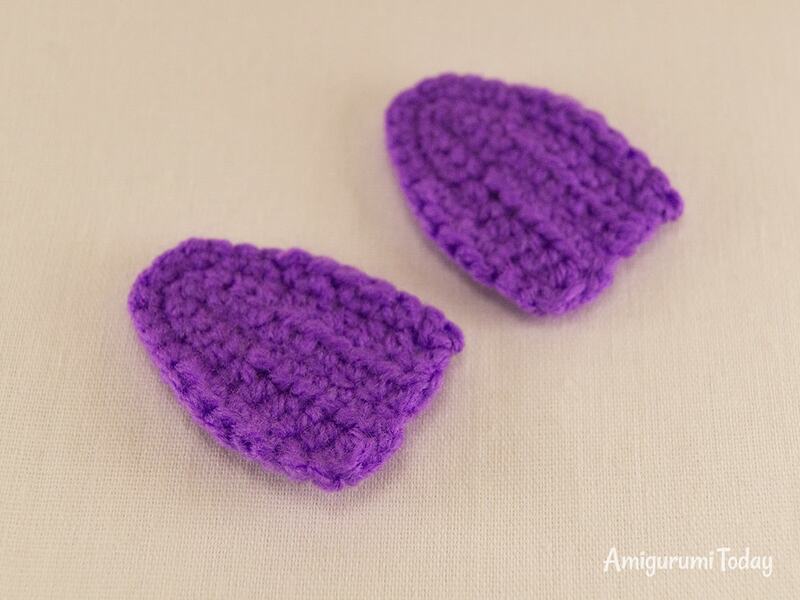 Please pay attention that the height of your crochet toy depends on yarn weight and hook size. 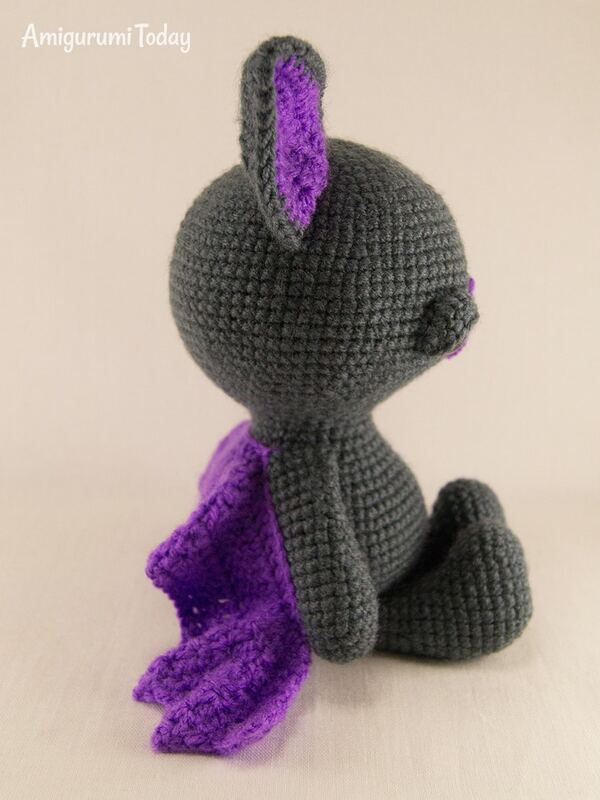 Crochet with dark gray yarn. Insert safety eyes between Rnd 20 and Rnd 21 at the distance of 13 st in between them. Fasten off leaving a small tail. Pass the yarn end through the front loops of the rest 6 stitches with your hook or sewing needle and pull to close the hole. Weave in the end. Work with dark gray yarn. Stuff 2/3 of the arm. Flatten the edges and crochet sc in next 5 st through both layers. Fasten off leaving a tail for sewing. 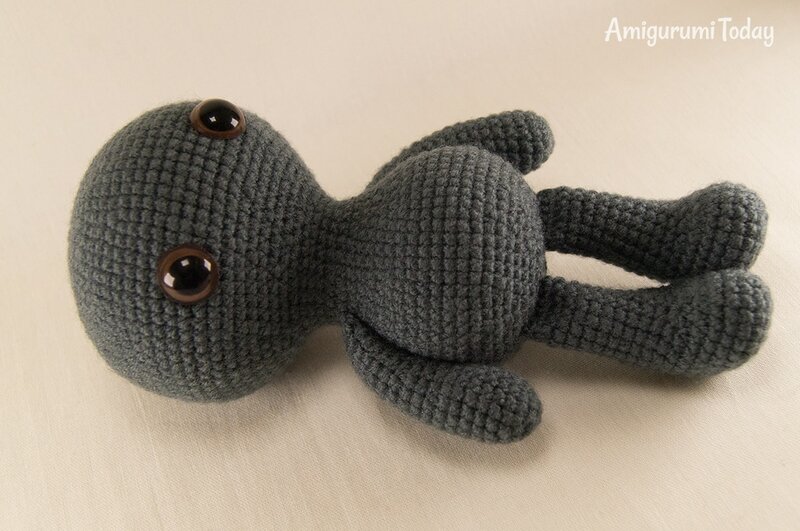 Crochet 6 ch with dark gray yarn. 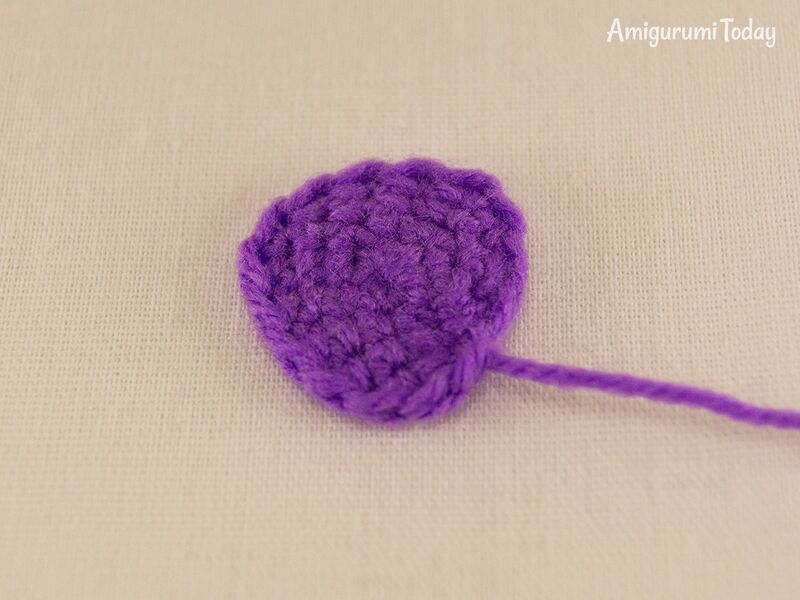 Continue working around foundation chain starting from the second stitch from your hook. Stuff 2/3 of the leg. Flatten the edges and crochet sc in next 6 st through both layers. Fasten off leaving a tail for sewing. 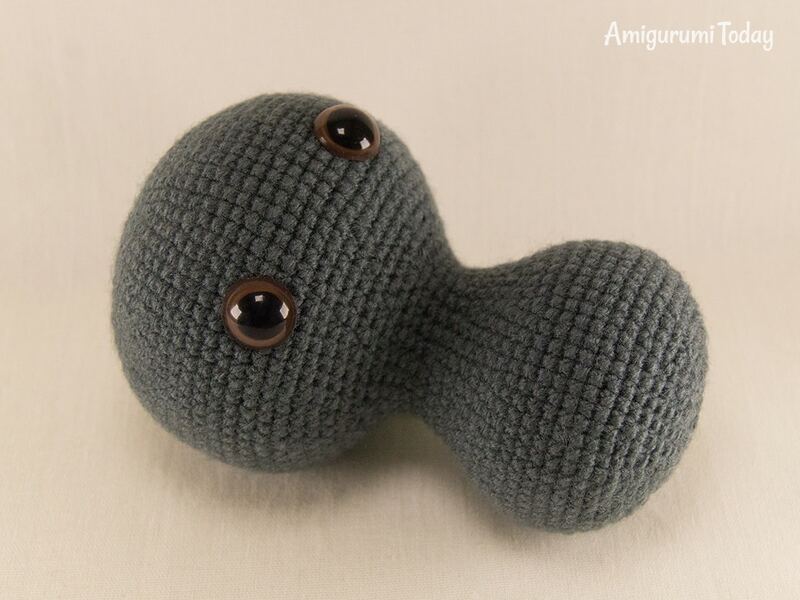 Crochet 8 ch with dark gray yarn. Continue working around the foundation chain. Rnd 1: sc in the 2nd ch from hook, hdc in next 5 st, 2 sc in last st, turn, sc in next 6 st, join with sl st.
Crochet 39 ch with violet yarn. Continue working in turning rows. Row 1: 2 dc in 3rd ch from hook, dc in next 35 st, 3 dc in last st.
Row 2: 2 turning ch, dc in the same st, 2 dc in next 2 st, dc in next 17 st, 2 dc in next st, dc in next 17 st, 2 dc in next 2 st, 2 dc in next ch. Row 3: 2 turning ch, dc in the same st, (dc in next st, 2 dc in next st) repeat 2 times, dc in next 18 st, 2 dc in next st, dc in next 18 st, (2 dc in next st, dc in next st) repeat 2 times, 2 dc in next st.
Row 4: 2 turning ch, dc in the same st, (dc in next 2 st, 2 dc in next st) repeat 2 times, dc in next 19 st, 2 dc in next st, dc in next 19 st, (2 dc in next st, dc in next 2 st) repeat 2 times, 2 dc in next st.
Row 5: 2 turning ch, dc in the same st, (hdc in next 3 st, 2 dc in next st) repeat 2 times, hdc in next 20 st, 2 dc in next st, hdc in next 20 st, (2 dc in next st, hdc in next 3 st) repeat 2 times, 2 dc in next st.
Row 6: 2 turning ch, dc in the same st, (hdc in next st, sc in next 2 st, hdc in next st, dc in next st, picot st, dc in the same st) repeat 2 times, hdc in next 2 st, sc in next 17 st, hdc in next 2 st, dc in next st, picot st, dc in the same st, hdc in next 2 st, sc in next 17 st, hdc in next 2 st, (dc in next st, picot st, dc in the same st, hdc in next st, sc in next 2 st, hdc in next st) repeat 2 times, 2 dc in next st. Fasten off and weave in the end. 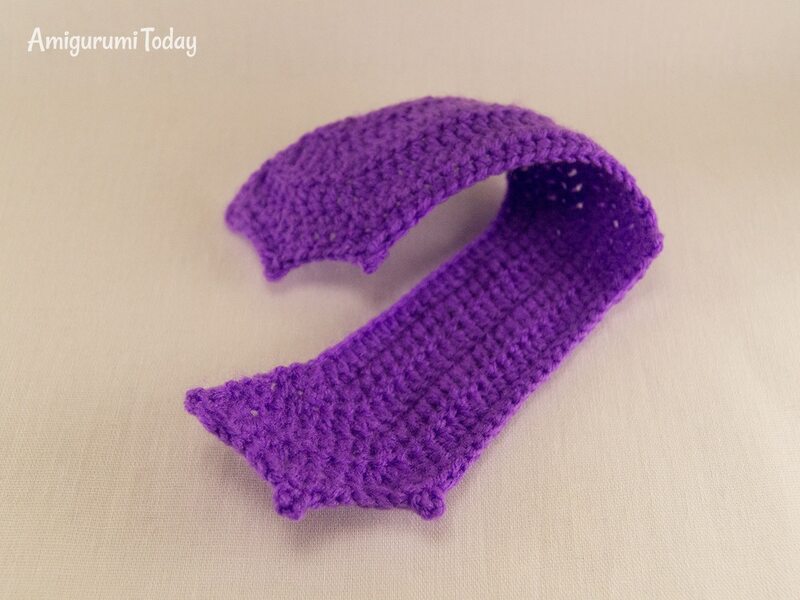 Crochet 12 ch with violet yarn. 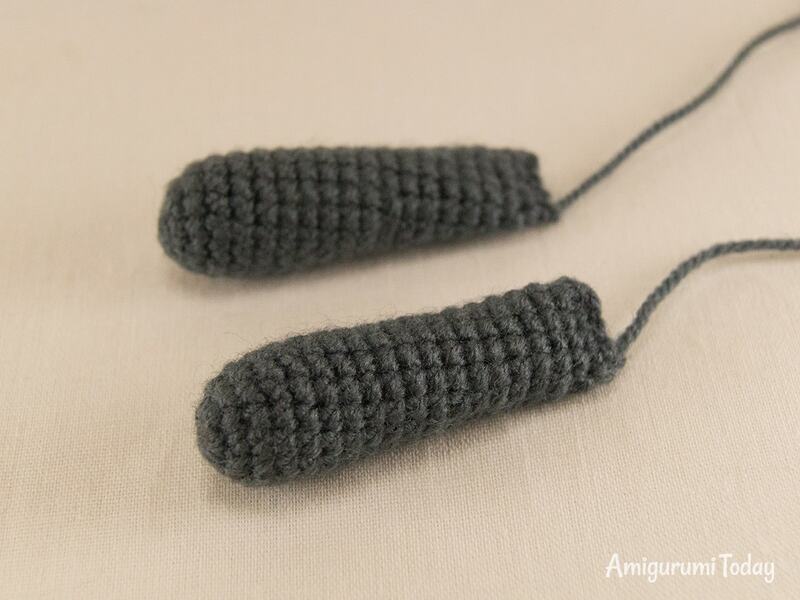 Crochet 12 ch with dark gray yarn. 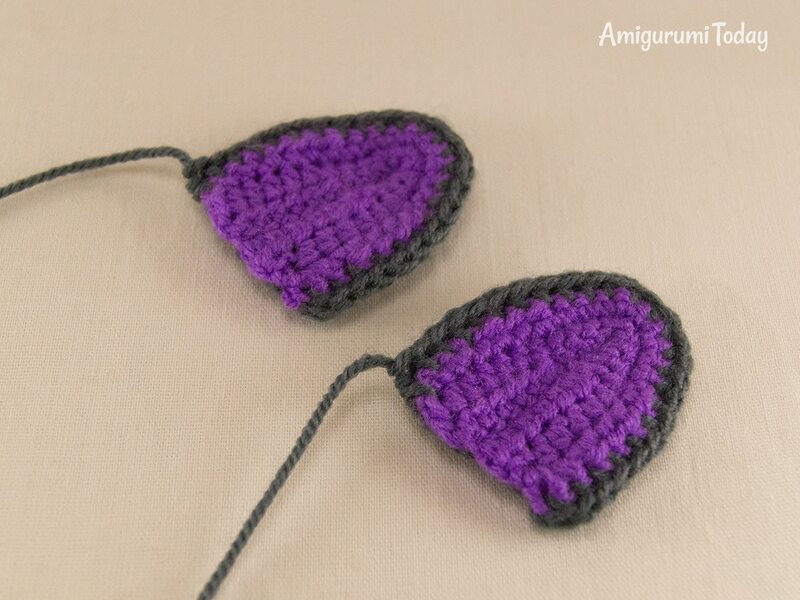 Repeat Rows 1-3 of the inner ear. Turn and work in opposite direction. 1. Sew on the arms at the level of Rnd 35. 2. 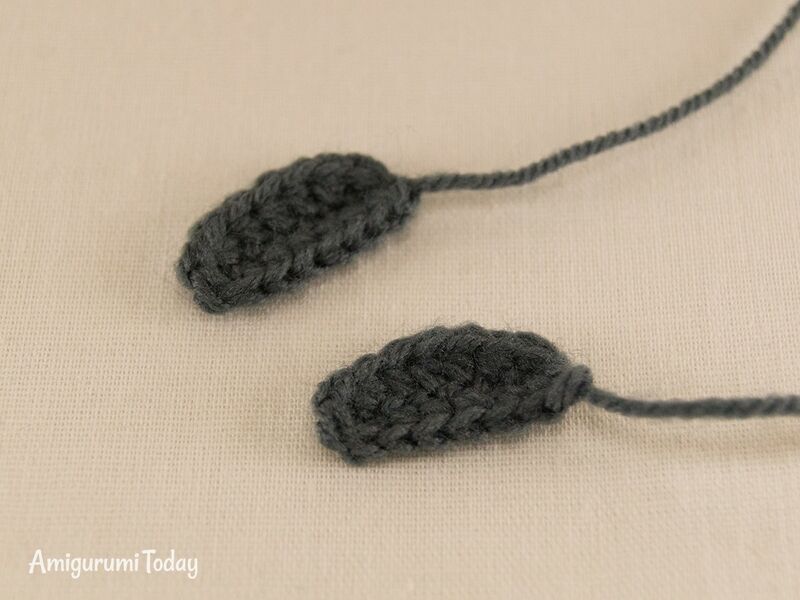 Sew the legs to the bottom of the body at the distance of 3-4 rounds from each other. 3. Sew on the wings starting from the middle of the back (at the level of attaching the arms) and continuing along the arms. Fix the “tail” of the wings to the back with a couple of stitches. 4. Sew on the nose between Rnd 17 and Rnd 25 of the head. Embroider nostrils. 5. Sew on the ears between Rnd 4 and Rnd 15 of the head. 6. Sew on the eyelids. Congrats! 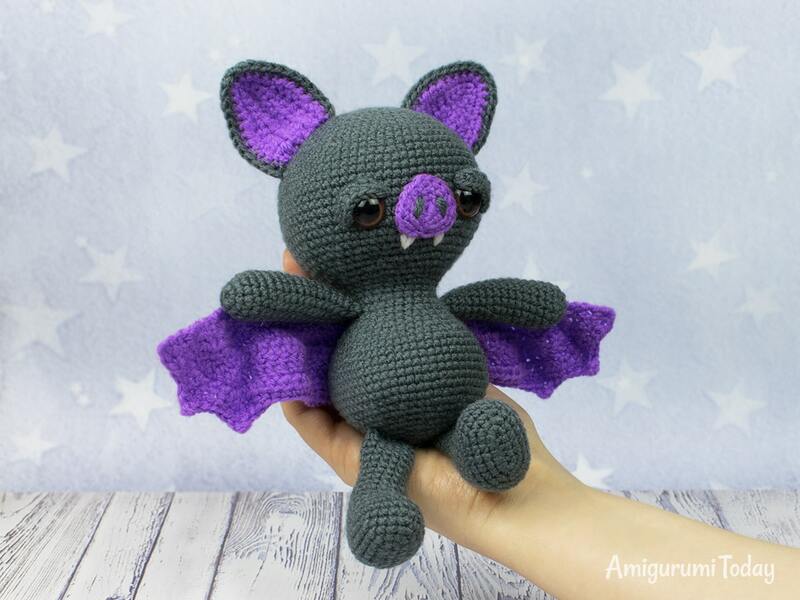 Your amigurumi bat is finished! 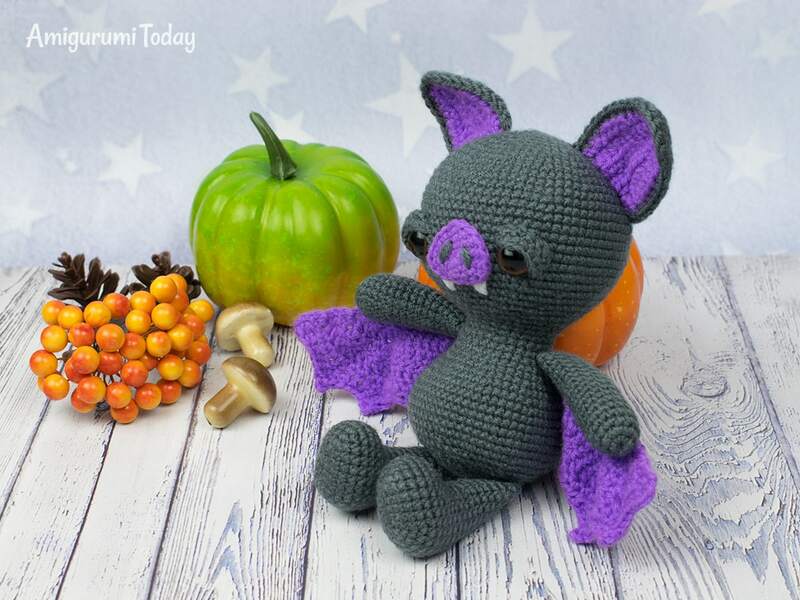 Share the pictures of your finished toy made with the help of this Soft & Dreamy Bat Amigurumi Pattern in our Facebook group. Happy Halloween! Can you tell me how to attach the fangs? 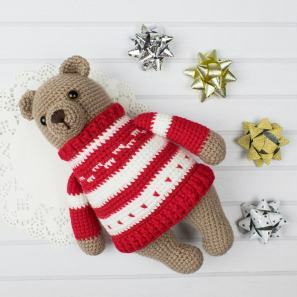 Is it possible to use a different sized yarn with this pattern? 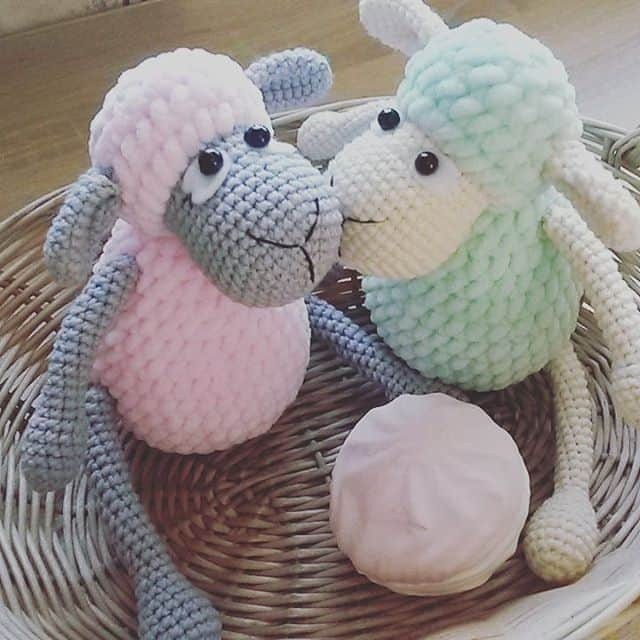 Can you please recommend a type of yarn to get to use for these please! 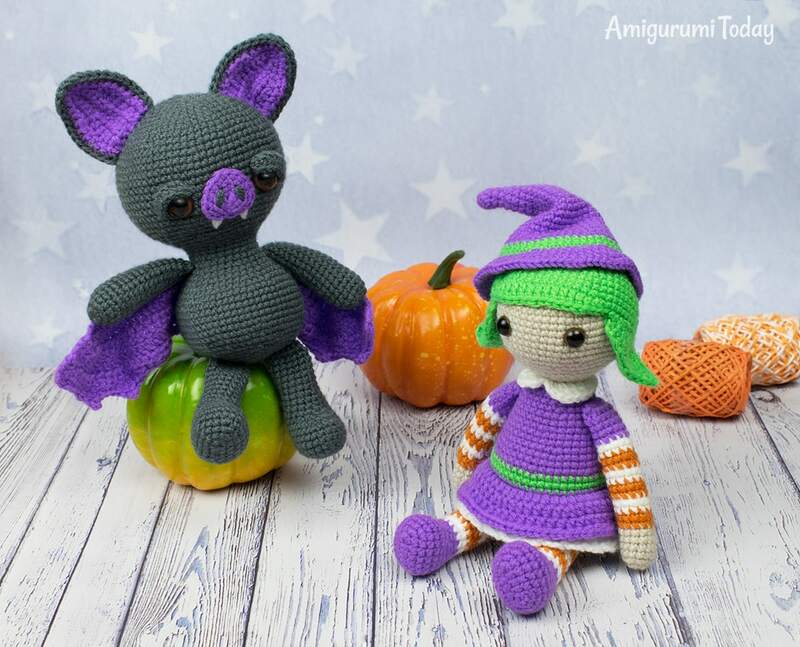 I really want to make these for my daughter she loves Halloween and I know she would love these! Her birthday is October 5th. So I have to get busy! Thank you!! 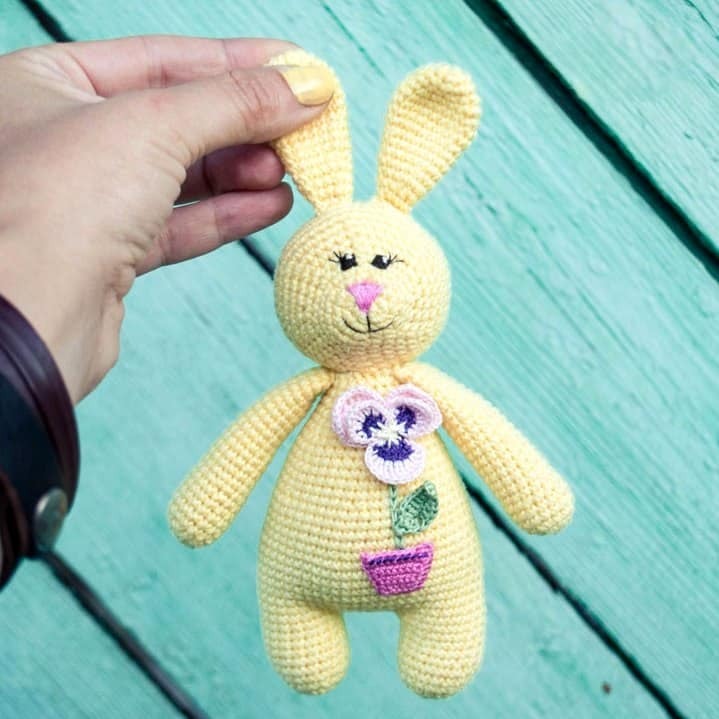 Hi Linda 🙂 You can use any 4-5 ply (super fine, fine, baby) acrylic or semi-cotton yarn. 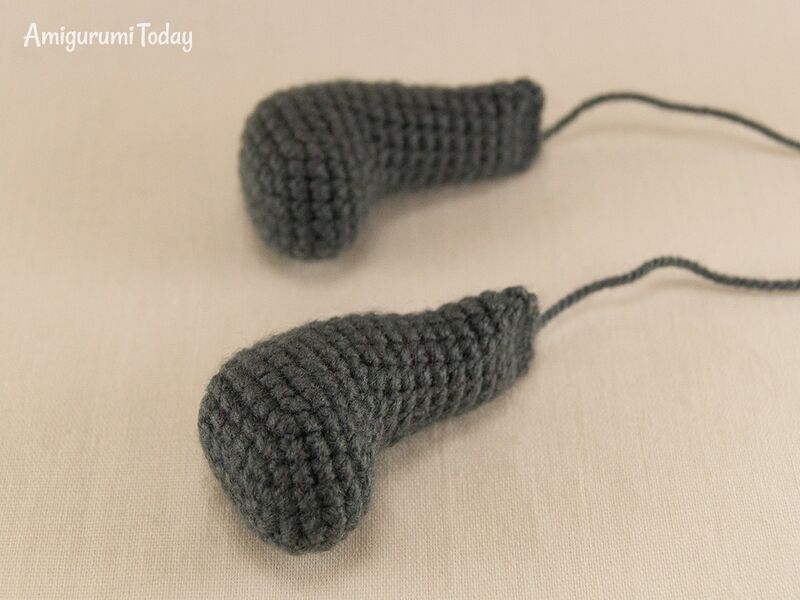 I used worsted weight 100% cotton. It’s not as soft as the recommended yarn, and it’s bigger, but it’s so cute and I just love it in the cotton. 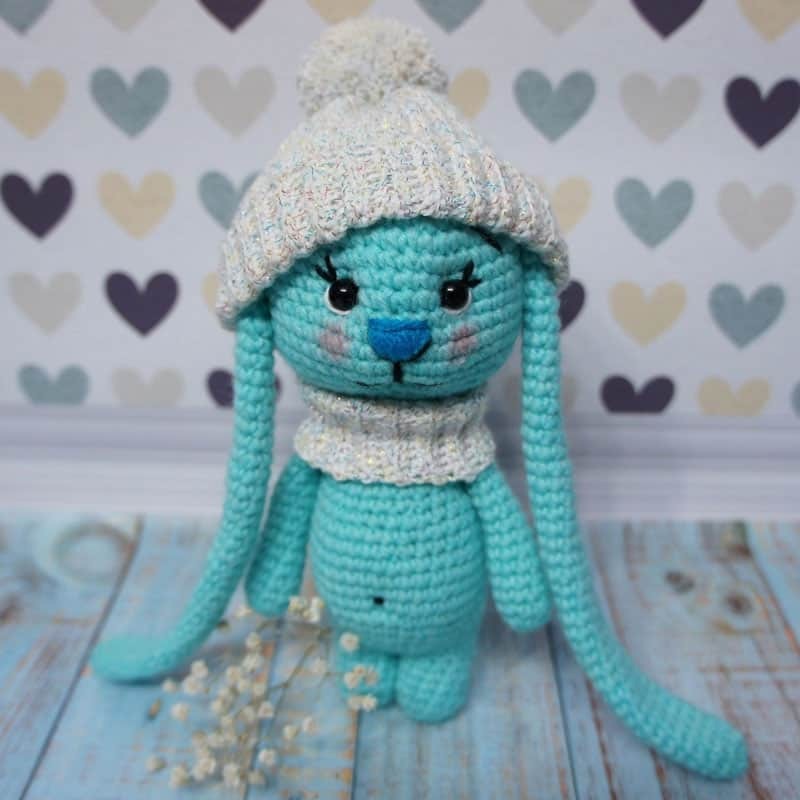 The stitch definition of cotton is so pretty.